NASA's new robot Valkyrie was designed for the DARPA Robotics Challenge taking place in December 2013. The newest humanoid robot from NASA just might be mistaken for a superhero. The space agency's new Valkyrie — a 6 foot 2 inch tall (1.9 meters) robot with a glowing NASA logo on its chest — bears an uncanny resemblance to Marvel's superhero Iron Man, but this space age automaton was built for work, not comic book heroics. A team of engineers at NASA's Johnson Space Center in Houston, Tex., designed and built Valkyrie in just nine months, according to press reports. A view of NASA's humanoid Valkyrie robot from the front. "We want to get to Mars," the team leader for Valkyrie, Nicolaus Radford told IEEE Spectrum in a video about the robot. "Likely, NASA will send robots ahead of the astronauts to the planet. These robots will start preparing the way for the human explorers and when the humans arrive, the robots and the humans will work together in conjunction building habs [habitats], laying foundation and just working together in that tight relationship. Technologies such as Valkyrie are going to really lead into the type of robotic systems that will one day be the precursor missions before the astronauts go to Mars." 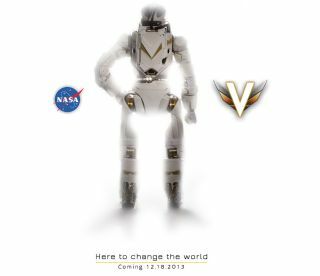 Some team members working with Valkyrie also worked with the space agency's Robonaut, NASA officials said. Robonaut was the first humanoid robot to fly on the International Space Station, and the agency recently announced that Robonaut 2 — currently attached to a pole in the orbiting outpost — will get its space legs sometime in 2014. While Robonaut also has a sleek look, Valkyrie seems to take it to the next level. "We really wanted to design the appearance of this robot to be one that when you saw it you were going to be like, 'Wow, that's awesome," Radford said. "It's a 44 degree of freedom robot, very capable, very strong, completely self contained. We have a two kilowatt hour battery, lots of onboard computing." The 2013 DARPA Robotics Challenge Trials are set to take place from Dec. 20 to 21 in Florida. The finals are scheduled for the end of 2014, with the winning team awarded a $2 million prize.